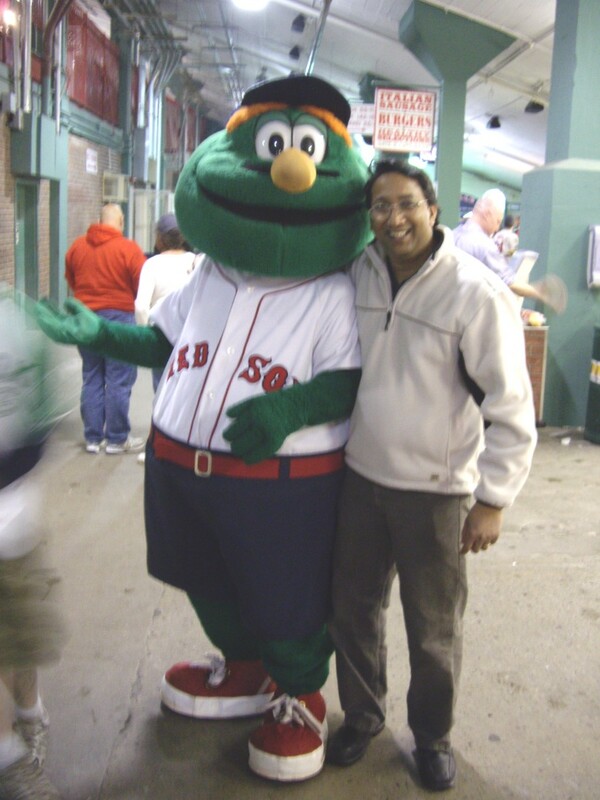 Mark christened me a Red Sox fan when he made me put an official Red Sox cap on my head. I guess if you enter Fenway Park wearing a Yankees cap, you may be asking for trouble and may end up getting it. Mark explained the rules of the game and I caught on pretty quickly. I find baseball far more interesting than cricket, mainly because something needs to happen every time the pitcher pitches the ball, unlike cricket where the batsman can bore the hell out of everyone by sitting around and leaving the ball or simply touching it. But I seriously think they need to re-engineer the bats a little. They kept breaking in half and I am told that it is a common occurrence. Another good thing about baseball is, unlike cricket, there is no third umpire. A third umpire in cricket is someone who sits in a closed room in the stadium and closely watches the game on TV and analyzes TV replays in slow motion. So if the two umpires on the ground are not sure which way to award a decision, they consult the third umpire by means of walkie-talkie. While this may be “fair” to the game and the players, I believe this has killed something. People no longer relive the game by discussing and debating decisions over drinks after the game or during play. You end up simply sitting and watching things as they happen and then maybe comment later. Sometimes sport gets far more interesting and enjoyable when people make on the spot decisions based on their assessment of the situation. I hope baseball does not follow that route. Don’t get me wrong. Technology is a good thing. Just that it makes us less human at times. 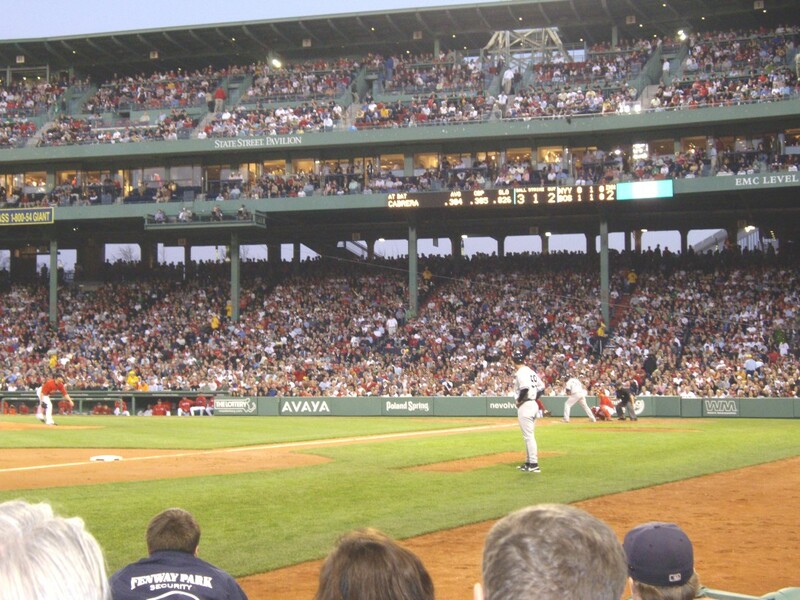 Fenway Park was almost sold out. The street leading up to the gate we entered was like one big carnival party with beer flowing everywhere. And that was probably the reason that the line to the men’s bathroom was way longer than that to the ladies, a first for me. 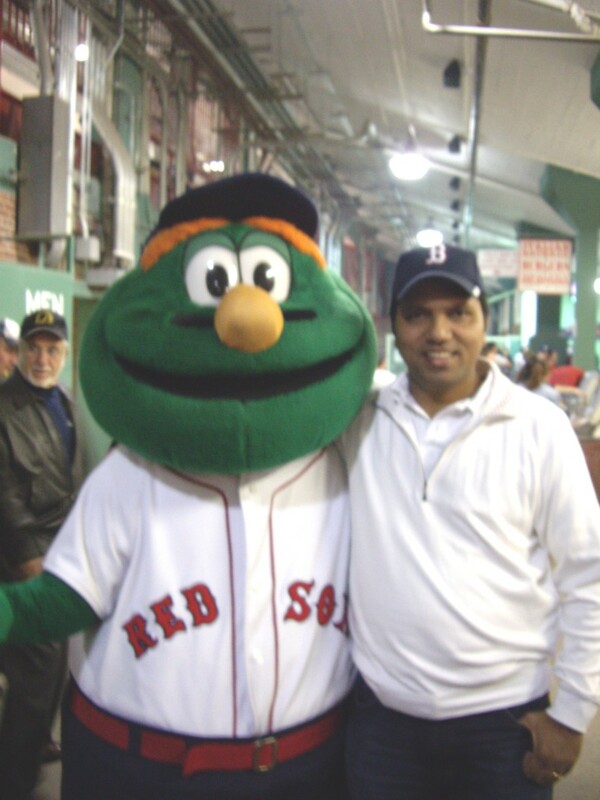 I even got to meet Wally, the Red Sox mascot. The Red Sox won the game 5-4 after being down 2 runs in their last innings. It sure was fun. I had a ball at the ball game last night. I will be keeping the ticket. This one’s special. Right now I am languishing at the JFK airport in New York. I just flew in from Boston this morning and my flight to Brussels is this evening at 6:10 pm. I guess that’s the price you pay when you tell your travel agent to get you the cheapest fares and then don’t bother to check connection times. This wraps up the US leg of my tour. I now begin the European leg which includes attending the ODA World Conference in Leiden, Holland, and a visit to Bricsys in Gent, Belgium.